If you’ve purchased Charles Hawthorne’s book “Hawthorne on Painting”, you might want to do what my friend Suhita is thinking of doing, which is to take one of Hawthorne’s ideas at a time and work with that. I tried that today. In the introduction of the Landscape chapter, I read this: If you will only put a spot of color in the right relation to other spots, you will see how little drawing it takes to make form. Let color make form, do not make form and color it. Work with your color as if you were creating mass — like a sculptor with his clay. Interest yourself in the relation of one color to another — in this way your color rather than drawing creates form. The value rather than the drawing make a boat stay behind the piles of a wharf. 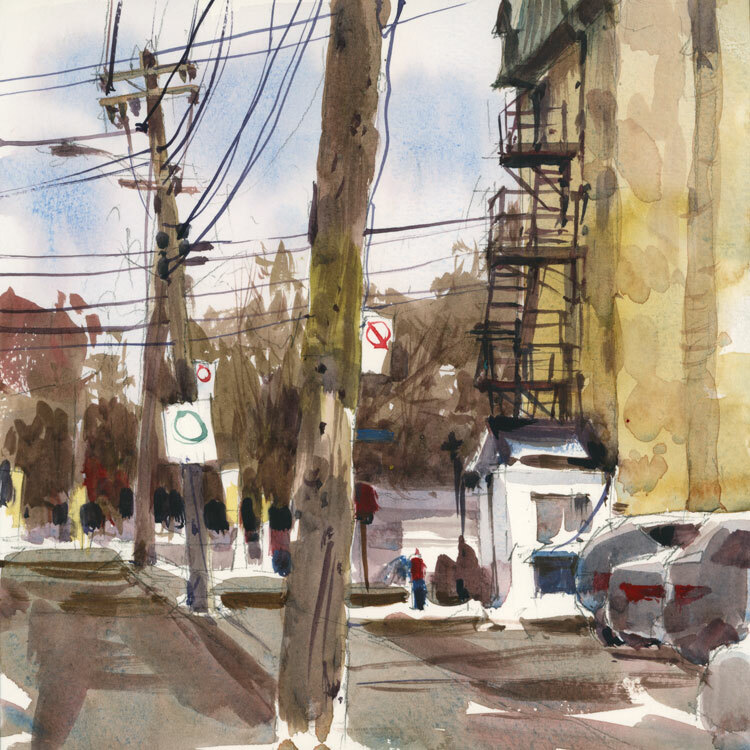 With that in mind I went out in search of a nondescript place to paint, nothing too pretty or picturesque (which is easy to find when there’s no snow in January in Montreal) and with no central structure (like a house) in the middle of the scene. Just a bunch of light and dark stuff. I did a bit of pencil drawing to set up the placement of elements on the page, and then with a limited palette of Raw Umber, Cerulean Blue, Organic Vermilion and a touch of Quin Gold, I tried to paint the relationship of shapes, one next to another. Near the end of the sketch, I dipped into some Phthalo Blue because I couldn’t get the darks dark enough to make the wires and the outside staircase. It’s not a great sketch, but it’s a really interesting process and I encourage you to try it next time you go out. Every time you put your brush down, ask yourself a question about what is next to the shape you are painting. How dark is the pole against the sky (very dark) or the pole against the trees (almost the same)? It’s a great exercise in looking. And keep this final quote from Hawthorne in mind: When you go out to paint and things mean only spots of color to you, you have your painter’s eye with you. Noted re Hawthorne, but the Blaukopf calligraphy (fire escape and cables) stands out for me. That’s the fun part Tony. I have this book by Hawthorn on Kindle. Since there are no pictures in it it is convenient. Thanks for experimenting with some of his thoughts. It’s rare to have a book about painting with no paintings in it, isn’t it? Shari: can you describe the process you use to photograph your paintings and posting them on the website? Are you using a camera mounted on a tripod? What camera? If the sketches are small like this one (8″ x 8″), I scan them. I have an Epson Perfection V600 photo scanner, so I use that. I use the Image Capture app and leave the scanner settings at their defaults. I open the scan in Photoshop and adjust the levels of darks and lights to match the actual sketch. Usually the scanned image is flatter looking with no contrast, so adjusting the levels takes care of that. After scanning thousands of sketches for my blog, the whole process takes about 5 minutes from scanning to final. I always save two copies of the image. One high resolution 300 ppi version tiff in case I need the image for print reproduction and one low res jpeg for the blog. I hope this info helps. If I have a larger painting I do photograph it with my SLR, but the colour is never as good as the scans for me. Thanks Shari. That really helps. Hi Reissa. I sometimes work wet-in-wet but not for this sketch. For this the only part that was wet before I added colour was the sky. I did a pass of clear water and then added my sky wash because I wanted it to be very transparent. Hi Jane. I’m sure Hawthorne is referring to oils in his quotes but I think they can apply to watercolour too. I think that after my first big, transparent washes, I do a lot of dabbing with spots of colour, so that’s when I think this placement of one colour next to another comes into play. I’ve never painted in gouache either but I did watch James Gurney at work. The man is a genius at putting down colour. You’re right about that. I think Hawthorne wasn’t referring to line at all in this. In fact I find some of his quotes about drawing quite funny. He often talks about ignoring the drawing or dealing with it separately, but if you look at his paintings, he clearly knows how to draw. I interpret that as “if you have already spent 10 years learning academic drawing, don’t spend a lot of time making lines on your painting”. Thanks Shari, I love these kind of challenges. Please do post some more ideas, I’ll start with this one today.. Your last course on Craftsy is also greatly improving my skills, glad I joined. Thanks so much for writing Ingrid. Glad you are enjoying the class, and that you are getting better too. Bonus!! Now I really need to get down to drawing with Hawthrone! Such a gem, so glad you posted about it Shari because I belong in that very small minority who hadn’t come across it yet! I know you will like it Suhita. Full, full of things to think about.